When Ford Prefect is hired as an editor for the Hitchhiker's Guide, he stumbles across a conspiracy to erase history itself. 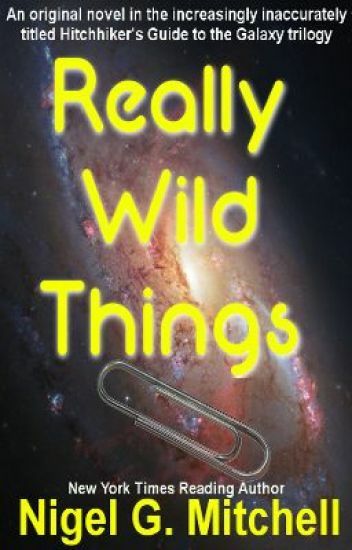 Ford, Arthur, Zaphod, and Trillian reunite in a novel full of excitement, adventure, and really wild things. THE FIRST THREE CHAPTERS of A BOOK OF SPIRITS AND THIEVES! The book is published by Razorbill and will be out June 23, 2015 & available at book retailers everywhere! Alchemy is told in alternating points of view. Both Jeffery, Eve's youngest son and Eve recount the events leading up to a family drama that plays out over the Christmas Holiday. This will be the first time all of the children have been home together in a very long time. More than anything Eve wants to make the holiday special for everyone. That proves an impossible task as problems in Eve and Jeff's marriage escalate out of control. Neither Eve nor Jeff have insight into how these family patterns effect their children's' lives. Jeffery provides a contrasting point of view as he navigates the choices he makes in his own life. Alchemy  is the fourth of five books exploring the lives of Eve and Jeff Lambert. Ginny is thrilled to return to her beloved Mabry's Ridge, but it won't stay the way she remembered it for long. Hanna Hamilton lost all control when she married Wesley McClelland, but when she decided to gain strength and stand up for what she's afraid of,  she takes her strength in a way you'd never expect. Zaphod's now President of the Universe, but he's unhappy and can't remember why. He and his trusty android, Marvin, cook up a plan that brings Death to their aid. Official Wattpad SciFi Competition Entry - Challenge 17: Something Borrowed. Using the character Marvin, the Paranoid Android and Discworld's Thief of Time as a setting, up to 4000 words. A year after Detective Ryan Maddox ended her partnership with Nathan Reaves, Maddox is soon called in for a homicide in a court room. One of the twelve jurors had died. Unbeknownst to her, Nathan Reaves is serving on the same jury. With an unwelcome meeting, and frightening news that this could only be the beginning of the killings, Maddox and Reaves find themselves competing to solve the case. As the case soon takes an unexpected turn, it is soon realized that Reaves and Maddox will have to work together to catch the killer. With the Court Date coming up, and more jurors in danger, will they be able to stop the executioner? TK returns to the scene of the original crime with TK53: Return to First Contact! 50 Shades of Grey is about people behaving inexplicably. Perhaps one of them is an alien. Traveling the back roads of Montana, not-quite-fearless art gallery owner Alix Thorssen is far from her home in Jackson Hole. Trying to clear her sister's husband of murder, she finds herself up to her Ray-bans in shaman's secrets, mysterious deaths, zealots, and madmen, not to mention -- ah yes -- passion among the pine needles. Whoever killed Shiloh Merkin hated her. But did Wade Fraser, University of Montana professor, do the deed? Alix follows a trail of moonlit rituals and legendary artifacts as another murder leads her to a chilling confrontation with a killer. In this first novel in the series, Lise McClendon weaves a gripping tale of suspense, blending Indian lore, the timeless clash of western values, and the magnificent landscape of the Rockies. but we still manage to make it back to the surface."